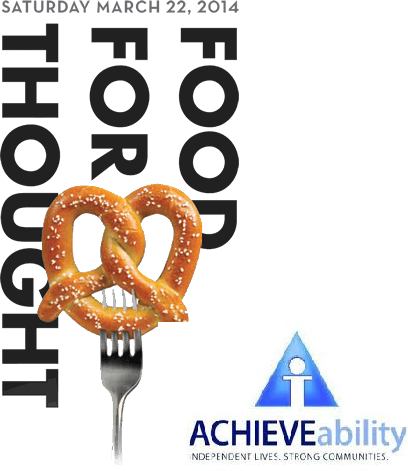 ACHIEVEability’s Food for Thought event with Presenting Sponsor PNC Bank, will take place on Saturday, March 22nd at 7pm at Urban Outfitters at the Navy Yard. This premier foodie event will feature more than 20 Greater Philadelphia area top chefs and restaurants. The participating chefs and restaurants include: Joseph Baldino (Zeppoli), Phoebe Esmon (Emmanuelle), Nathan Johsson (Garces Trading Company), Steve Linneman (Shop 543), Chip Roman & Fred Ortega (Tradestone Confections), Keith Rudolf (Terrain Garden Cafe), Lance Silverman (Sabrina’s Café), David Simms (Eatible Delights), Brad Spence (Pizzeria Vetri), Justin Swain (REX 1516), Karen Weinstein (Doc Magrogan’s Oyster House), Peter Woolsey (Bistrot La Minette), Harvest Seasonal Grill, Little Baby’s Ice Cream, Shake Shack, and La Colombe Torrefaction. In addition, Del Frisco’s Double Eagle Steakhouse will be treating our distinguished VIP guests to some of their signature drinks and tasty dishes in our VIP Lounge. Tito’s Handmade Vodka will be providing their handcrafted and award-winning vodkas and Yard’s Brewing Company and Weyerbacher Brewing Company will be serving a selection of their craft beers. Thought is ACHIEVEability’s most important fundraiser of the year – raising funds to support its work to break the generational cycle of poverty through their Family Self-Sufficiency Program and their Community Services Office. Since 1981, the Family Self-Sufficiency Program has provided subsidized housing to low-income and formerly homeless single parent families who desire a better quality of life. The program requires all of the parents to balance school and work while caring for their families. Our parents take a minimum of 5 college classes per year and also work at least a minimum of 30 hours per week. In recent years, ACHIEVEability has extended the core principles of the Family Self-Sufficiency Program into the Haddington and Cobbs Creek communities through their Community Services Office. The office works with residents to organize, access, plan and implement activities and utilize information which will contribute to achieving a healthy, vibrant, technologically-savvy and hopeful community. The Community Services Office also connects community residents to valuable resources including utility assistance, foreclosure assistance, and financial education classes. Food for Thought 2014 will be a great event filled with world-class cuisine, live music, and fun activities including a wine and beer toss and an auction. Tickets are available for purchase now! General tickets are $200, VIP tickets (includes reserved parking, access to the VIP Lounge, and a special VIP gift) are $300 and Young Friends tickets (35 and under) are $100. All tickets can be purchased via ACHIEVEability’s website.